A postcard depicting a dress parade outside of The Citadel, The Military College of South Carolina in Charleston. Built in 1820, the original citadel stood on what is now Marion Square. In 1842, Governor John Peter Richardson III (1831-1899) called for the conversion of The Citadel and the nearby Arsenal into military academies. It was occupied by Federal troops during the American Civil War, but reopened in 1882. At that time, Marion Square was created in front of it as a military plaza. Originally published by Paul E. Trouche. "Brief History of the Citadel." The Citadel. http://www.citadel.edu/root/brief-history. 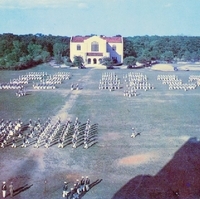 “Dress Parade at The Citadel, The Military College of South Carolina Postcard.” RICHES of Central Florida accessed April 18, 2019, https://richesmi.cah.ucf.edu/omeka/items/show/6773.